During the past decade, data have piled up increasingly and became more diverse in nature: a development that is asking more and more from the databases they are stored in, creating all sorts of challenges ranging from organizational, to scaling, to security. Therefore, a movement toward different databases and different store technologies for different use cases has arisen. In traditional senses, all data would be stored inside one database that essentially is a relational database. When new relationships would be encountered, exhaustive joins would be executed with SQL in order to add these relationships. Moreover, when examining these relationships at diverse levels, querying becomes slow and inefficient. In case we’d stumble upon ready-to-read and read-only purpose data, we’d have to ask ourselves if this really is best practice or if we’d have to look further for other, non-relational, database types to store these specific types of data. For visualizing and studying complex relationships, Graph databases are more than convenient. They can be used to do easy, simple and fast querying, or even search via a user-friendly UI such as in the graphical exploration application Neo4j Bloom. The queries are smaller, more elegant, faster and consistent in performance when retrieving relationships. Graph databases are also very good at diving into the deeper layers, and they display flexibility over time and use. The returned graphs visually display relationships between elements, that provide insights of added value in the data. 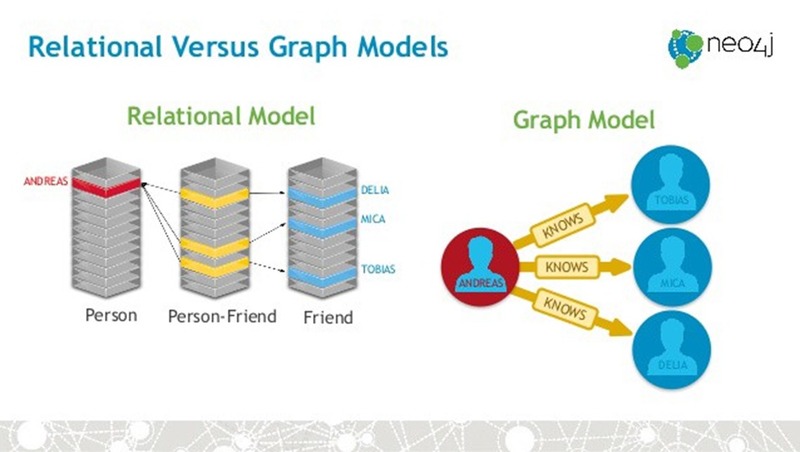 So, what are Graph databases? Graph databases use graph structures for semantic queries. 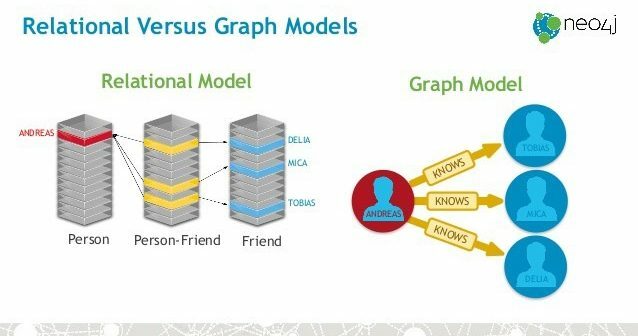 The graphs consist of nodes, edges and properties to represent and store data, and therefore look like network models. These are in contrast to, but also closely related to, relational databases. Relational databases are more of the type “rows in tables”, where the relationships are (foreign key) constraints. In Graph databases, relationships are stored as a first-class entity and they are aimed at storing data with many layers of connections, adding richness of depth to the data. Therefore, they allow for an advanced level of abstraction by going deeper and deeper into the layers of data. Graph databases generate the graphs by computing the shortest path between two (or more) nodes. They also do well in searching and visualizing patterns. The most popular, mature and deployed Graph database is Neo4j which ranks high among all used databases, however, relational databases are still at the top of the list. Other Graph databases include OrientDB, AllegroGraph, AnzoGraph and Oracle’s Spatial and Graph option. When to use a Graph database? … the data have many layers of connections. … relationships frequently are many-to-many. … the relationships are equally relevant or even more important than the entities themselves. … the possibility exists that the database will gain in complexity. … low latency for return of information is a recommended feature. … the queries are small and simple. Cypher is a declarative query language for Neo4j. Neo4j is implemented in Java but accessible from software written in other languages by using Cypher, for example, through the built-in REST API. Neo4j’s query language Cypher allows for fuzzy queries. And, according to its developers, it upholds the ACID standards (Atomicity, Consistency, Isolation, and Durability) to ensure the data is safe and stored consistently. a “node” is an object or entity, such as a person or an artefact. It can be labelled. a “relationship” is the edge between the nodes, a label to describe a relationship with a direction & diverse connection types. It can have properties. “properties” are additional information either applying to the node or the relationship. a “traversal” navigates through a graph and finds paths by means of queries (Cypher). “paths” are retrieved from traversal. “schemas” are optional and can be added to increase performance or gain modelling benefits. It can also be added after some time if it is desirable. “indexes” on properties are helpful to improve speed of lookup and gain performance. a “constraint” is useful in keeping the data clean, allowing specification of a set of rules for what the data should look like. Cypher is case-sensitive for nodes or node labels, relationship types and property keys, since these are manually assigned. Cypher is case-insensitive for cypher keywords such as MATCH and RETURN, which are also understood if written “MaTcH” and “rEtUrN”. However, consistency in the query code is good practice. Let’s say there are two Sashas, then constrained validation failed! 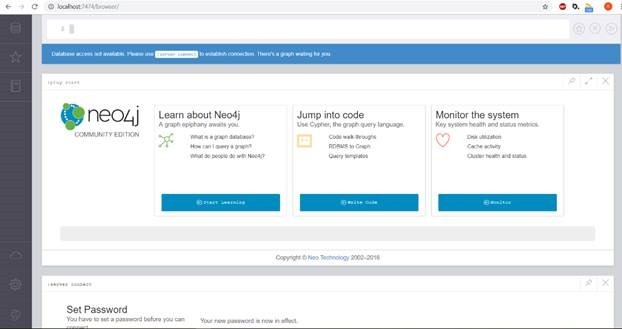 So, you have a check in there 🙂 For more understanding of the Cypher queries, try for yourself with the Neo4j Demo below. It is possible to convert relational database data to graphs by locating the foreign keys, join tables, and replacing them by relationships with or without properties. Run any VM with Docker Host. Official Docker images are available for Neo4j. Here we use Neo4j 3.0. Create the directories “neo4j/data” and “neo4j/logs” inside your home directory. To fill the database, see the .txt document added here. Lots of open source projects (Apache, Affinity, Nuvala, Stig, Pegasus, and others). 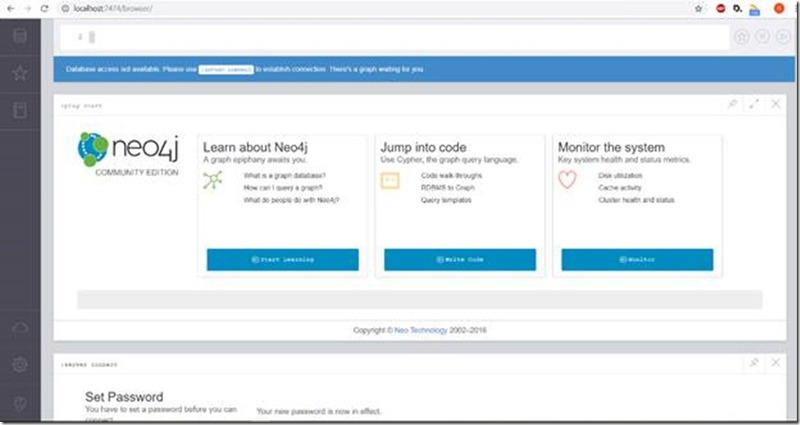 For learning purposes Neo4j Sandbox provides sample datasets and built-in guides. Caution: keep the queries simple and small, since the performance of Graph databases decreases by the increase of size and complexity of the queries (why Graph databases?, 1 year of Neo4j). In conclusion, Neo4j is a great Graph database that is easy to use and understand. Letting go of the relational databases is definitely not necessary, since the Graph databases can be useful as an addition to them, especially for (parts of your) data that are strongly interconnected. They leverage the relationships, optionally can provide some level of decoupling from the original data source, and allow fast and simple data retrieval at various depths that bring added insights in the data and their relationships. I'm inspired by people, and interested in people, science and technology. I have an interdisciplinary background through studies in Liberal Arts and Sciences and Molecular and Cellular Life Sciences. I dive into a subject, learn it, love it, own it, and move on to the next challenge. If I’m correct, you’d be able to open the link now. If you still have troubles opening it, please let me know.